He has a openly gay producer that works on the shows. Why don't you contact him? Send me an email and I'll give you his name. I prefer that my name not be used. Dr. Phil's show is owned by Harpo, um, OPRAH! If you're going to apply pressure, that's the best place to start. He's not going to trade ratings for "the right thing to do". Thank you for the tip. Will be sending it on and writing a quick note. 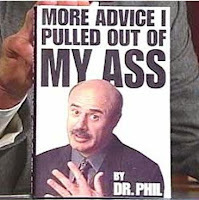 I really don't see a problem with this article or with Dr Phil's approach. Honestly I think this article is just written by someone being hyper-sensitive and looking for a scapegoat to beat up another story on how badly "we" are treated. Don't get me wrong, I am generally outspoken about issues of homophobia in the media, I just don't see this as an issue at all. People do struggle with these issues, and people do have questions that they need help with - I see nothing wrong with a show on this. As for a show on teen transgender - I lean towards agreeing that such a show shouldn't be aired... Can you imagine the fall-out for the kid afterwards in a country like America? I don't believe that with the way things are at the moment (transgendered people still struggling for acceptance) pushing kids on National (Global!) television shows is not a good idea. A show on adult transgendered people? Absolutely! How does this fraud still have an audience? Eventually, Dr. Phil (McGraw) will be off the air. It happens to be best and worst of television. When he goes, he will be forgotten. On the other hand, the GLBT community will still be around. However, that may NOT be a winning proposition. For example, the word "gay" has evolved from meaning happy, exited, and merry to refer to an alternative male sexual orientation. There is absolutely nothing to keep the word from further evolving into meaning a griping, whining, and malcontent person with a proverbial chip on their shoulder. Groups do not get to define their own labels. Just ask the Religious Right. Conservatives are trying desperately to lose the baggage associated with that sticky sobriquet. "Dr." Phil is a big fat bully, who seems to get off on laying into any poor unfortunate, normally a small and frail woman, who is desperate enough to go on his show. I do wish I'd bought his Diet book though... when it was out. "Hi, I'm a frigging water buffaloo with a fat head the size of a radioactive watermellon, but I've got some diet and exercise advice for y'all." Dr. Phil said nothing that would suggest that he's against the GLBT community. Nothing. Yes, he had a guest representing Focus on the Family. He also had a guest on the show who was transgender- positive. Representing BOTH sides of the issue is NOT a bad thing. - Bi, proud, and not offended by Dr. Phil. I don't think it is an issue where you bring someone from both sides. You are either a psychology based show or quack. Should we have a show debating whether the Earth is flat, one side pro and the other not? Sure, we can be it's a waste of time and misinformation. This misinformation hurts lives. I love the picture, haha; so true. Why does anyone still watch him for any reason?